Presumably, Sheffield City Region’s High speed rail Meadowhall connectivity ‘factsheet’ was intended to make the case for a HS2 station at Meadowhall. The first major national transport infrastructure project since the inception of the motorways, HSR will modernise travel in the UK. It will provide a genuine alternative for long distance journeys by providing more seats at the right times of day for the UK rail network. Our early forecasts are that up to 15% of customers who currently use the Midland Main Line (Sheffield) and 50% from the East Coast Main Line (Doncaster) will transfer to HSR. In addition to this, we project up to 66% of Cross Country users could utilise HSR when they make inter-city journeys. This transfer provides the opportunity for rail planners to overhaul the traditional rail network and and serve new destinations and provide improved connectivity for people within our region. ‘Up to 15% of customers who currently use the Midland Main Line (Sheffield) would transfer to HSR’, i.e. 85% of Sheffield customers who currently use the Midland Main Line would not transfer to HS2. Never mind, wouldn’t new-build HS2 at least avoid the need to do disruptive enhancements work on the existing lines? Improvements to existing lines are required, in addition to building a national HSR network, to enhance the capacity and performance of the current railway and to promote economic growth. Sheffield City Region local enterprise partnership has launched its ‘OnTrack4HS2‘ website, which is hosted by D3 Creative (it offers ‘business websites from £3,000’). HS2 is critical to future business growth in the north and to the economic success of the Sheffield City Region in particular. It will encourage investment and make doing business easier. In the Sheffield City Region HS2 is forecast to create more than 5,000 jobs. There will be fantastic supply chain opportunities for local businesses. Building HS2 is a £42.6 billion project, involving the laying of 330 miles of track, the construction of four new stations and the redevelopment of five existing stations. In addition, new rolling stock will also be needed to run on the line – again creating potential opportunities for local businesses. HS2 will reduce passenger journey times between Sheffield and London and will also vastly improve connectivity between the Sheffield City Region and other key cities in the UK including Birmingham, Leeds, Nottingham and Derby. Connectivity will also be improved to the regional tram and bus network. Under the current proposals the Sheffield City Region will benefit from having one of only a small number of stations on the HS2 phase two line. Between Birmingham and Leeds the line will only have two stops – one at Toton, serving Nottingham and Derby, and the other at either Meadowhall or the city centre. The location of the Sheffield station will be decided in mid- 2015. HS2 will provide a major boost for the Sheffield City Region’s rail industry which already has more than 200 companies employing more than 6,000 people. The region is home to a number of major rail manufacturing firms including DB Schenker, Volker Rail and Hitachi. It is anticipated that these as well as many other local firms could benefit from HS2 – and it could attract other firms into the region in the future. HS2 offers the opportunity to rebalance the UK economy – shifting the emphasis away from London and allowing the Midlands, North West, Yorkshire and North East regions to thrive. Recent decades have seen the balance of the UK economy shift away from the north as its traditional manufacturing industries have declined. HS2 phase two presents real opportunities to reverse this trend. HS2 phase two will significantly address the capacity issues facing the rail network – as our population grows and passenger numbers increase. It will also help to ease congestion on the motorway network. HS2 will, for example, provide five new services every hour between both London and Birmingham – in addition to the two conventional rail services each hour between these cities, which will continue after HS2 is built. High speed trains will also be larger and longer than existing services enabling them to carry more passengers. In turn this will free up capacity for rail freight, boosting the region’s growing logistics and rail import/export business. HS2 also presents real opportunities to improve capacity on existing rail services in the Sheffield City Region. A study by the West Yorkshire and South Yorkshire Passenger Transport Executive has estimated that by improving existing services in this way the Sheffield and Leeds City Regions will gain additional benefits of between £300m and £800m. Recently it was announced that one of two centres of excellence for high speed rail engineering to support HS2 will be built in the region. Doncaster was chosen for the site of the National High Speed Rail College in October 2014. The college, which opens in 2017, will ensure the country as a whole has the skills and expertise needed to deliver the HS2 project. Birmingham will be second site for the college. the likelihood of the ‘City Region’ becoming a world leader in high speed rail is effectively zero. South Yorkshire Passenger Transport Executive is spending £235,000 on an assessment of the strengths of rival Meadowhall and city centre options for a proposed Sheffield HS2 station (The Star reported). […] The work is being carried out by consulting engineers Pell Frischmann and is due to be completed by March. A further £47,000 is being spent by SYPTE on ‘media and engagement work’ for HS2 by IPB Communications. Details have been revealed in a report to Sheffield City Region Combined Authority, which represents the area’s local councils. It comes just a few days after plans to make £7.6m cuts were unveiled by SYPTE. Its proposals could see up to 50 jobs lost and information centres closed. The proposed Meadowhall high speed rail station design is unsatisfactory, according to January 2014’s Sheffield “city region” HS2 connectivity study (produced by Arup for South Yorkshire PTE). As might be expected from an infrastructure company, the study recommended extensive investments across Sheffield city region, to support access to Meadowhall HS2. As well as tram trains to Doncaster, a ‘swift Supertram Express’ transfer is “considered critical to attracting business users to the HS2 service at Sheffield Meadowhall”. Arup made no mention of the costs, or any benefit-cost analysis, of its proposed local connectivity package. But it seems likely that the bill would be in the £1 billion to £2 billion range. Using MVA’s forecasts, Arup estimated passengers by time of day, who would use Meadowhall HS2 (but not a scenario where Midland Main Line offered Sheffield Midland to St Pancras in about 100 minutes, well before 2033). Their journey time comparisons with classic rail look somewhat problematic, as no interchange penalty seems to be included. The morning flows would be predominately outbound in nature. As can be seen, the volumes suggest that large subsidies, and empty seats, would be hallmarks of the project. And whatever David Higgins might say, there is no possibility of ‘easing pressure on the London housing market’ by having piffling numbers of commuters coming 250 km from Yorkshire, etc. In Split Decisions, I outlined the application of a split and join technique to maximise path utilisation on West Coast Main Line services to Liverpool and Manchester via Crewe. The same idea could also be used to improve capacity utilisation on the Midland Main Line (MML). At present, separate long distance high speed services operate between London St Pancras and Derby, and between London St Pancras and Nottingham. Rather than take the direct route along the Erewash Valley, the London — Sheffield relation is effected by trains continuing beyond Derby. Various service reconfigurations are possible to improve MML generalised journey times and capacity utilisation. With electrically hauled pendular trains routed via the Erewash valley, London St Pancras — Sheffield Midland could be brought down to perhaps 1 hour 40 minutes, or less. Unlike HS2, such trains could continue to the town centres of Barnsley and Rotherham. Imagine a scenario where Derby and Nottingham had a thrice-hourly service from St Pancras, with the portions splitting and joining at Ratcliffe-on-Soar (‘East Midlands Parkway’). 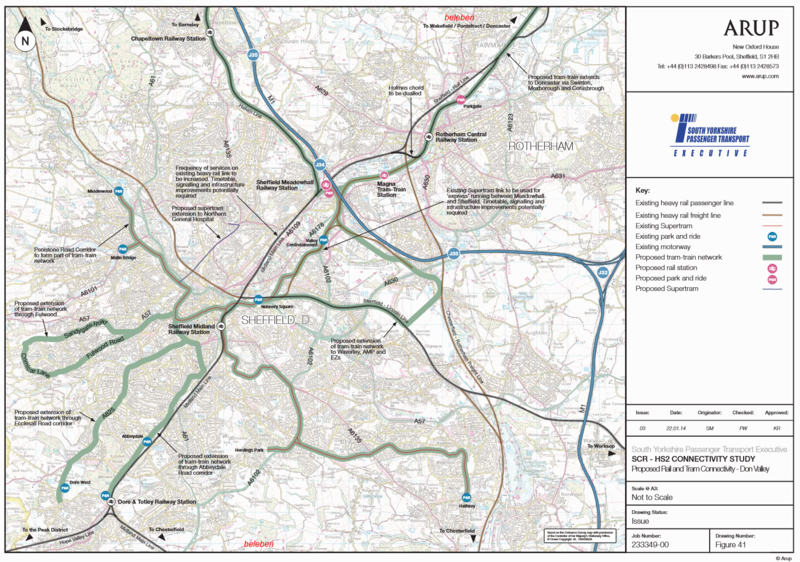 The convenience and journey time benefits compared to the HS2-to-Toton proposition would be compelling. HS2 Ltd has produced a South Yorkshire ‘factsheet‘, showing Sheffield Midland station (although the company’s high speed trains would not stop there). HS2 will widen opportunities for millions of people linking our big cities with London and with each other. It will re-write journey times between Britain’s major cities creating a high speed line that will integrate the economies of Birmingham, East Midlands, Sheffield, Manchester, Leeds and many more as never efore as well as linking them with London, the South East and Europe. Journey times from existing stations such as Sheffield Midland (above) will be reduced as a result of linking to HS2 at the new high speed rail station at Meadowhall. Projected journey times from the new station, for which no suitable comparisons exist, are given below. 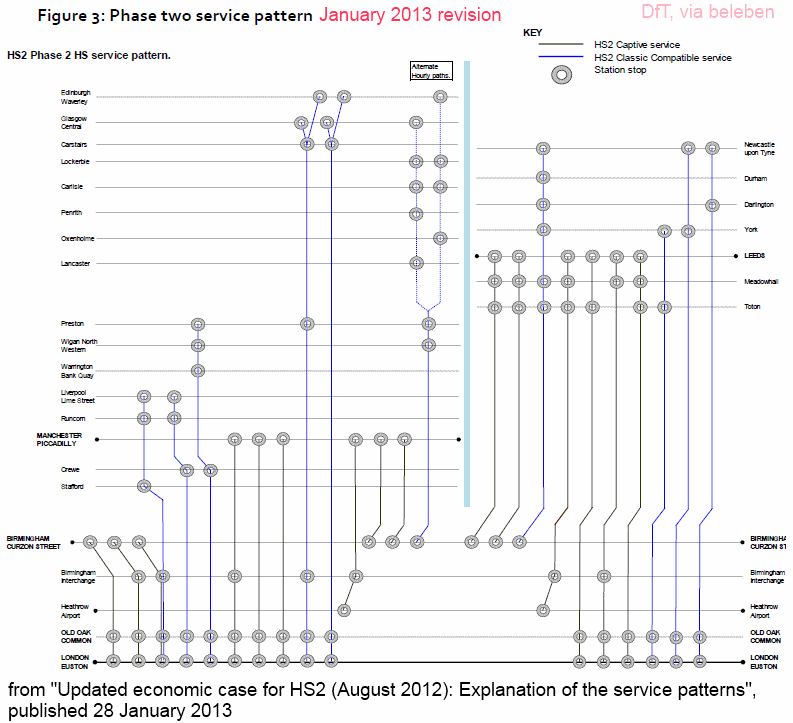 According to HS2’s January 2013 service pattern, there would be two trains per hour to London, not three as claimed in the factsheet. Local trains between Sheffield Midland and Meadowhall take 5 or 6 minutes, but passengers tend to prefer no-change journeys, so from Sheffield Midland, a more realistic HS2 connection weighting might be around 17 to 22 minutes. The Department for Transport has revealed councils and businesses ‘likely to benefit’ from HS2 ‘could be expected to make a financial contribution’, and Sheffield is likely to be asked to shell out from a £500 million fund set aside for projects around the city. Coun Leigh Bramall, Sheffield Council cabinet member responsible for transport, said: “We met with the Transport Secretary two weeks ago and were never told we would be expected to make a contribution. A Department for Transport spokesman said: “Any third party contributions will depend on local circumstances and could take a variety of forms.